In Part 1 of this essay, I covered various strategies and ideas for recruiting young individuals in the sport of weightlifting. I went over the role of the coach or club manager in the recruiting process and on how to sell the sport to young athletes. In part 2, I will go over talent identification and talent screening. I will go over key abilities that I think are good indicators of talent for weightlifting as well as discuss the general concept of talent and personality. Pretty much any dictionary or web-encyclopedia like Wikipedia will define talent as a natural aptitude or ability to execute a task in the correct manner. Wikipedia defines an aptitude as ” a component of competency to do a certain kind of work at a certain level” which is all to say that the individual is born with an out of the ordinary ability to do a task. These aptitudes are mental and physical. Talent does not develop over time (as in you either have it or you don’t). If you are born with it, you can refine it and exploit it but If you are not born with talent for the given task, you will never do it as well as the best in the world, although you may enjoy doing it and get many positive benefits from doing it. There are three level of talent in athlete in my opinion (Read here). In the context of weightlifting, talent could be defined as the natural ability of a young children to effectuate weightlifting movements in a coordinated fashion as well as having a very good awareness of their body (in space and during movements) added to a natural ability to understand and refine some of the most complex movements known in sports. To me, a weightlifting talent is a kid who, after very few pointers and demonstration, can pull the bar with straight arms, while having a straight back and open chest, not looping around the knees (or knocking them) and bringing the bar to the hip. A talented 10 years old kid will do all of the above in a graceful movement. A natural talent will still need coaching to refine positions, rythmn, strength, and general technique, but, we could say that the movements pretty much look 80-90% (I made up these %) correct the first time they try. If you see a kid with such ability, that’s the kid you want to invest you time in (performance and successful-wise). 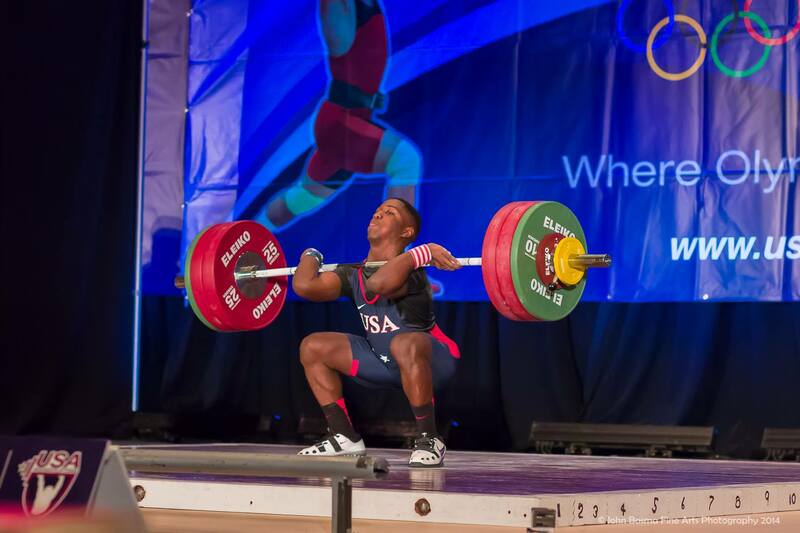 14 years old CJ Cummings broke senior records at the 2014 US nationals. 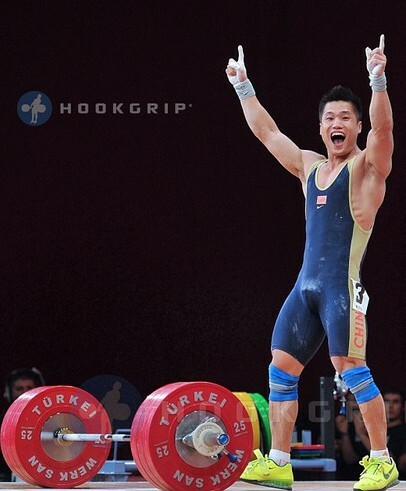 Credit Hookgrip. The ability to naturally set the body in the right starting position for the pull is a good indicator of body awareness and control of every body segments. I have seen 9 years old kids go to the bar, without any demonstrations, and naturally use the best starting position they could have used. On the other hand, I have seen 12-14 years old kids round their back (turtle back) after being told to flatten their back or showed the position you want. One is talented and one will need to work hard. The jumping ability of a kid is a good indicator of their ability to develop power, coordinate movements, and their ability to be efficient. Height or length of the jump are good indicator of efficiency and power. I also look for their ability to use both legs (not be a single legged jumper), ability to make no noise when landing (ability to control their body weight in the air), and their ability to sequence a fast but simple movement. Again, I have seen kids be naturally able to jump on a box that is of belly button height (or more!) using both feet and landing with both feet standing up in a perfect erect position without making landing sound. On the other hand, I have also seen kids not be able to jump over a hurdle of mid shin height, and doing so by sending 1 foot first. The ability to understand the task at hand, ask precise and specific question and the ability to transform such comprehension in the right motor output is probably the most important factor because this is the basis of the coaching process. A kid that has such comprehensive abilities will understand that you need to lock your elbows in the jerk after you tell him to do it for instance. As another example, a simple cue like flatten your back should make them flatten their back in the starting position (or throughout the whole pull). Again, I have seen 8 and 9 years old kids be able to do so perfectly after being shown the task. That’s the kind of body awareness you want in a young lifter as this is a kid that has the natural ability to process specific postural changes in order to refine movements and become more efficient. The squatting and lunging ability are good indicator of flexibility and balance, both very important in weightlifting. Motivation. No matter how talented a kid is, he/she will have to be motivated if they want to last. If a kid is enjoying weightlifting and has the right physical abilities right off the bat, he/she will be good later on as long as the instruction is good. Your goal is still to identify talent that will last and motivation is probably the best indicator of future commitment. Ability to focus on the task at hand. When I hosted the training camps at our club, I could see that some kids were completely unable to focus and would disrupt the course. On the other hand, I could also see some kids be extremely focused and really perfectionists. A good weightlifter is a perfectionist and will never be satisfied with anything less than perfection, no matter how much of an utopia that is. Some kinds can display such behavior from a very, very young age. This can be learned though. Personality compatibility is important for long term success. Talented individuals need to find a coach they can relate to or want to learn from. The coach need to find kids that have the right personality for their coaching style. For instance, I value hard work, focus, and dedication. People I coach have to have this kind of personality trait or it can’t work in the long term. I do not want to be bothered by drama, aggressive behaviors, fights, anti-social behaviors or lack of dedication. Some coaches don’t mind and will put up with it, though. That is all to say that you need to find someone that has the right physical talent for weightlifting, and the right head for your coaching style/or to get more out of your coaching ability, if you want to produce successful weightlifters. Jessica Jean from Ontario (Canada) has been lifting for 2 years (if i’m not mistaken). This video is a year old. 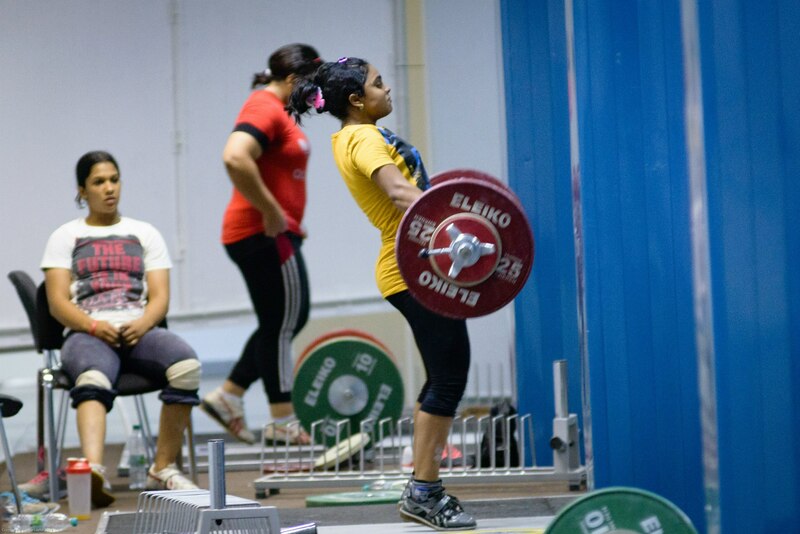 She is now front squatting 122kg and jerked above 100kg. She is a natural talent. She trains out of KanamaHP (Toronto) and felt like the world should know about her progress. Weightlifting is not a sport where we have the luxury of having the possibility to use some kind selection process and, ultimately, our motto is pretty much the more (serious/committed individuals), the merrier. Most clubs are lucky if they even find a way to get 5 kids involved in weightlifting. This is not like Hockey in Canada where hundreds of kids go through various stages of selection to join a team. Nevertheless, my general approach is that I will do my best to get any talent that I identify to join the club and be coached by me. I will do any convincing it takes. I try to not leave anything to randomness. I dedicate a lot of effort towards that and go out of my way for it. That being said, I don’t push less talented kids away. I think weightlifting is a sport that can teach healthy practices, show kids how to grow healthy, strong and develop their character. I give them the same attention as the more talented kids. Some coaches don’t do that and I think that it is a mistake. It is very simple to understand that kids will bring kids in the club which will in turn translate in a better recruiting and it will be easier to sell the club to parents when they see the club has X amount of kids registered. That being said, I’m willing to let it be more of random process and the coaching approach is different.